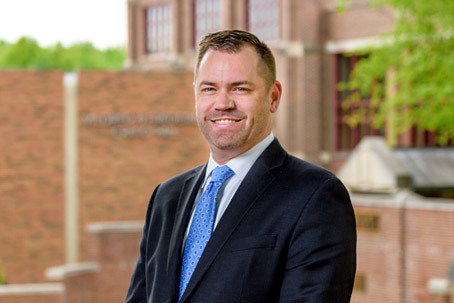 As vice president for institutional advancement at Rose-Hulman, Steve Brady oversees operations involving fundraising, alumni affairs, and corporate and foundation giving. Brady came to Rose-Hulman in 2016 from the Illinois Institute of Technology (IIT), where, in ten years, he significantly grew the major gifts program, introduced a metrics-driven method of measuring outcomes, and led a successful $250 million comprehensive campaign. Brady began his career in higher education fundraising at Webster University in Saint Louis where he worked as a student phonathon caller. After graduating with honors in 1996, he took on the role of the university’s phonathon coordinator for three years. He then served for six years at Saint Joseph’s College in Rensselaer, Indiana, as director of the college fund, raising the alumni donor participation rate by 11 percent and increasing phonathon revenue by 40 percent in just six years. In 2006, Brady joined Chicago-based IIT as a major gifts officer, but was soon asked to serve as acting director for alumni relations. Within a year, he moved into a role as senior director for major and planned gifts, later adding the role of associate campaign director in 2010. He was named campaign director in 2013. Steve and his wife, Jill, are the parents of two children, Jack and Eleanor.